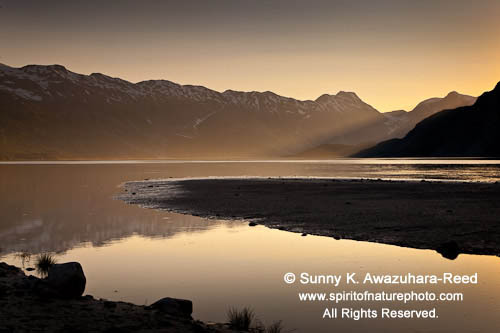 Glacier Bay is known as a "marine park." The main part of Glacier Bay National Park & Preserve is ocean. Only 200 years ago, the majestic Grand Pacific Glacier covered the entirety of modern day Glacier Bay. The glacier retreated rapidly and left a deep water way called a fjord. There are 16 glaciers, numerous inlets and countless islands in Glacier Bay, however, this spectacular landscape is only accessed via the water ways. 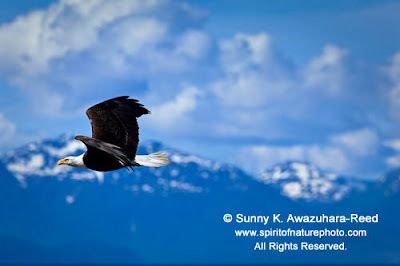 I have been exploring the natural environment in Glacier Bay for 2 months. 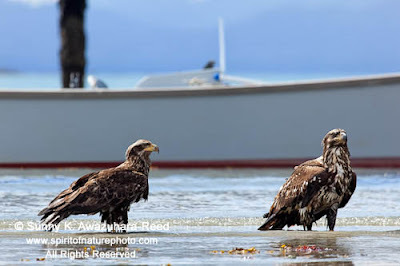 I have been photographing the moss drenched rainforest, wild coastline, and bald eagles from the land, and additionally some glaciers and humpback whales from boats. 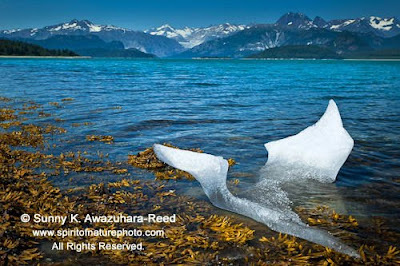 Glacier Bay is a "Y" shaped bay; only the left side of the Y, west arm, can be accessed by power boats. Kayaking is the only way to explore the east arm, which includes Muir Inlet. In early August, myself and three friends headed to the east arm paddling two double kayaks. White fog enveloped the bay and the surrounding mountains... even the green water of the bay was milky white in the fog. It was a mysterious morning for our adventure. I felt like I was in old Chinese paintings. The mist burned out in the afternoon... the blue sky showed up above us. The wild mountains on both sides of the bay were majestic. 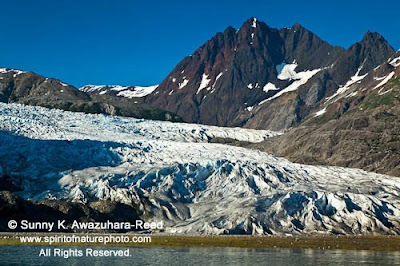 White and blue glaciers capped some of the high peaks! The water that we were paddling in was emerald green like a tropical ocean. Paddling all day, many coves and beaches were passing behind. The water of the fjord was slowly narrowed as we progressed northward. 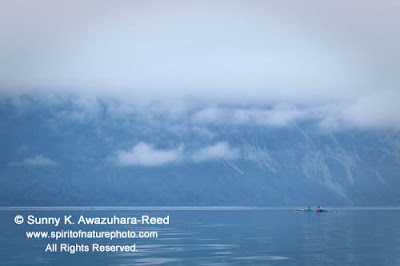 After passing the first glacier in the east arm of Glacier Bay, we kept paddling to the north. 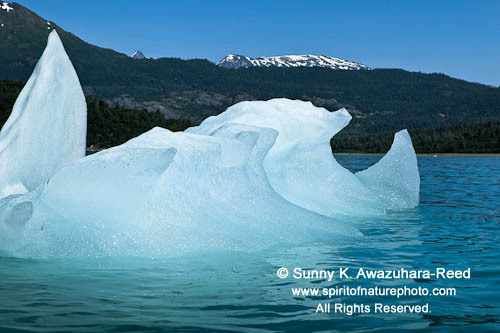 I was excited to see an iceberg on the shore! Riggs Glacier where we would camp our first night was far away it seemed. More icebergs were drifting in the water... but we kept paddling . It took us more than 3 hours to get there after seeing the glacier. When we passed McBride Glacier, which was giving birth of many icebergs, the surrounding terrain was dramatically changed! Fewer trees were on the shore now, and the canyon cliffs were lofty on both sides of the water. After 27 miles of paddling, we arrived at Riggs Glacier. Riggs Glacier was calving icebergs into the water 50 years ago...however, it has been receding and no longer sends ice into the bay. 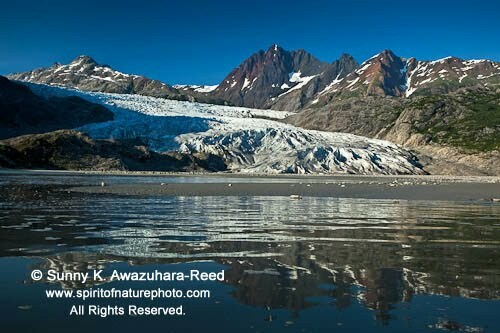 Several melting streams run through large mud flats in front of the glacier. Two bald eagles were sitting on the rock to welcoming our arrival. Our view of the Riggs Glacier from the camp was unforgettable. 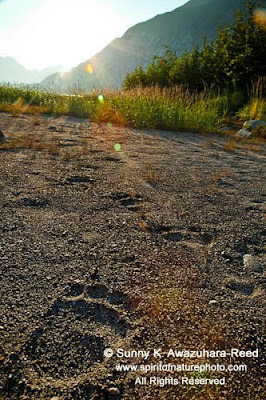 However, there were gigantic bear prints near our camp... I have never seen such huge prints! 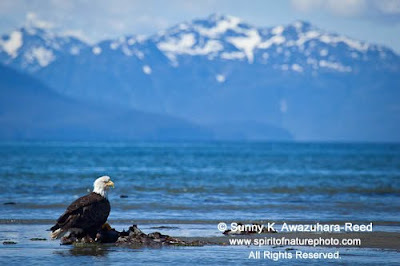 Large numbers of Bald Eagles live in Southeast Alaska. 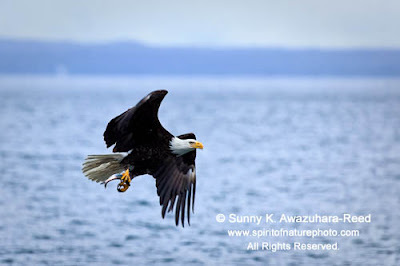 Bald Eagles are often seen here in Glacier Bay National Park in Southeast Alaska. With a body length of upwards of 30 inches and a wingspan of 90 inches, it has been an impressive sight to see these large birds fly right above my head. When the tide is low on Alaskan beaches, eagles can be seen scavenging. 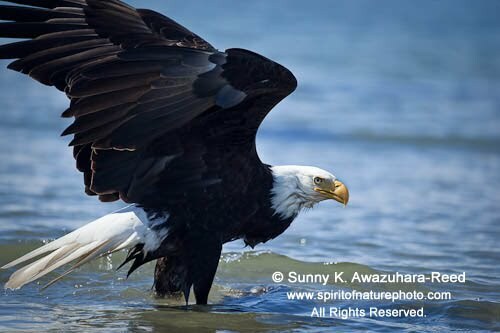 One particular bird I recently saw was feeding on a fish for a long time... Several others were looking at him and trying to steal the food in his claws. They often fight for the food. 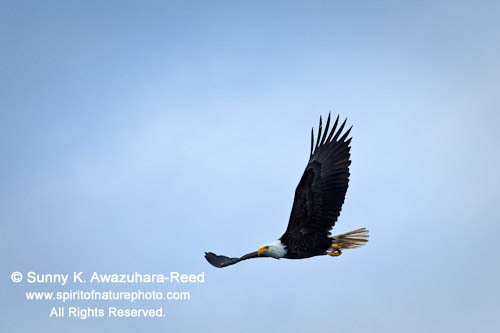 Adult Bald Eagles have black bodies with a white head and tail with a yellow beak and legs as everyone knows them as the American symbol. 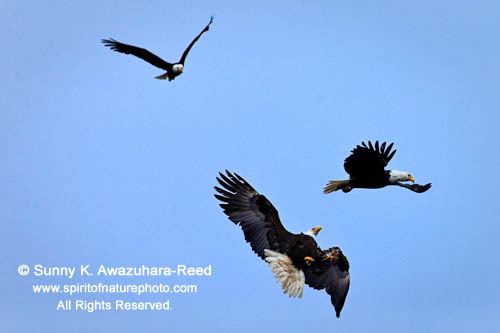 Immature eagles are mixed colors with brown and white until 5 year old. When they reach maturity, their heads turn to "bald" just like some humans. 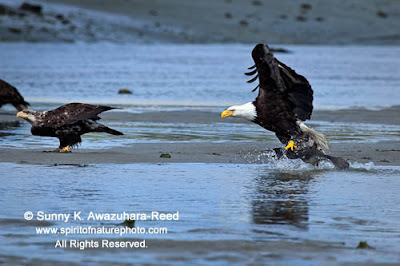 I think whoever named "bald eagle" did a good job.